• Chronology of events leading to RERA. • Detailed analysis covering all the salient features of RERA. 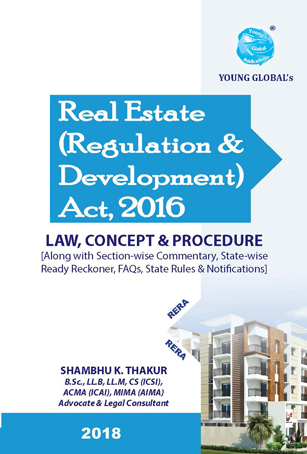 • Key provisions of the RERA analysed in the introduction of the book itself. • Frequently Asked Questions as well as Maharashtra-FAQs. • Statewise comprehensive RERA ready reckoner. • Up to date rules (States & UTs). • Sectionwise Commentary on RERA. • Analysis on constitutional validity of the RERA. • Detailed analysis based on relevant case laws. • Analysis of RERA vis-à-vis IBC, GST, Benami transactions, Consumer Protection Act. • Comparative study of dilution of the state rules vis-à-vis Central Act. • Detailed information & analysis based on report of committee on subordinate legislation. • Analysis based on deliberations took place before standing committee & select committee. • State-wise key information in respect of promoter vis-à-vis registration of the real estate project. • State-wise key information in respect of real estate agent. • Key information in respect of complaint to be filed with adjudicating officer, regulatory authority and appeal before appellate tribunal. • Particulars of functions & duties of promoters in tabular form. • Provisions with respect to penalty and compensation in a table.